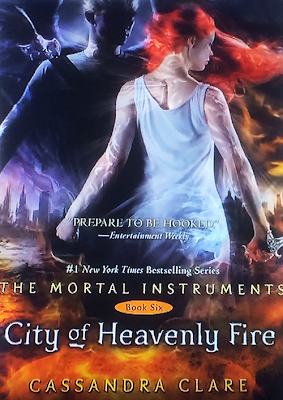 So, the nice version of the cover of City of Heavenly Fire that went up on TV yesterday! Yes, that is Clary and Sebastian. Yes, Clary is wearing white. She does wear white in the book at a certain point. There are interesting details up close about both their weapons, and if you look closely you can see the chain of Clary’s necklace. Remember the covers of the books don’t use the runes from the Codex or that we saw in the movie. They are pretty designs, but they don’t mean anything. 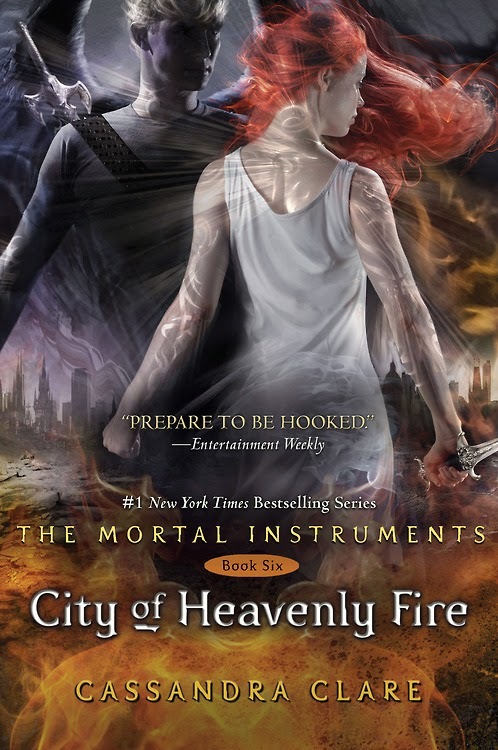 Finally, the Cover to CITY OF HEAVENLY FIRE is Revealed! Hope you didn't get to teary looking at this AMAZING cover. Just in case you missed it, notice how Clary's dress is white? "For death and sorrow, the color's white" Have any predictions? Also, there seems to be a little dispute going on between who is on this cover? 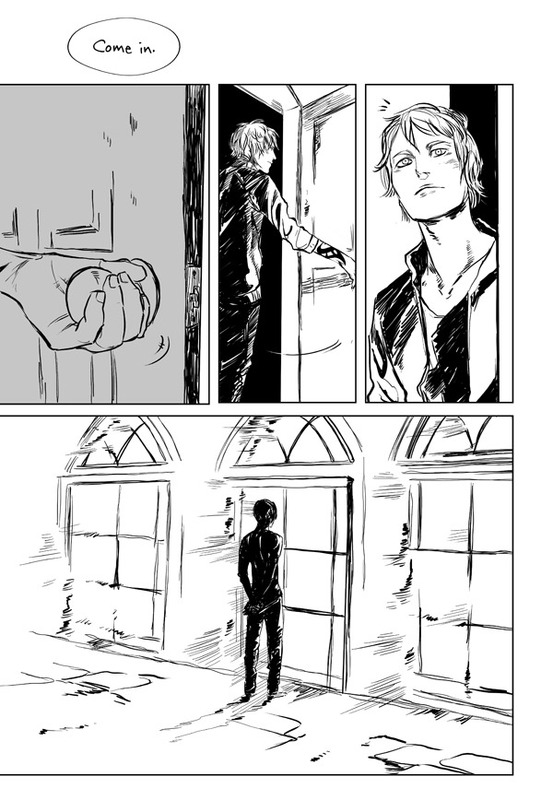 Jace and Clary or Sebastian/Jonathan and Clary? “@crazyforHOAn1D: " Who is the guy on the cover? Sebastian right?” It's Clary and Sebastian. Have any dream casts in your head, yet? Sound off in the comments! 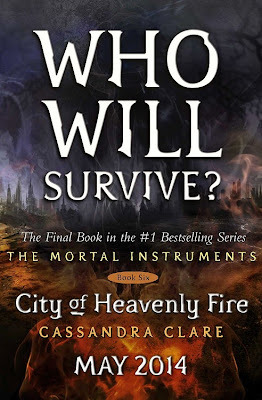 At the end of December, Cassandra Clare revealed that the official cover for City of Heavenly Fire would be released some time in January. Now, we have an official date; on Tuesday, January, 14 at 7pm EST, tune into CBS television to watch the unveiling of the City of Heavenly Cover! If you don't live in the US/don't have that channel/etc, don't worry because The Insider will have it up online shortly after. Sorry for the delay, but I've been on vacation and then I had to catch up on work... But I now have time to catch you all up on the latest Shadowhunter news! Epic Reads is hosting their annual Book Shimmy Awards! Brace yourselves because there is a lot of competition out there; try not have a break down while trying to vote for a book. Of course, Clockwork Princess and City of Bones are included in this years round of nominees. In fact, Clockwork Princess is included in 3 different categories: Couple of the Year Award (Will and Tessa), The Pagemaster, and the Best of Shelves. While, City of Bones is included in 2 categories: Best Book Fandom, and Best YA-Adapted Movie or TV Show. Polls close on December 22nd, so vote now! Earlier this year, the Hollywood Reporter had heard from Constantin that the sequel to The Mortal Instruments: City of Bones would start filming in 2014. With MTV's latest chat at Glamour magazine's Women of the Year Award with our Clary Fray, Lily Collins, she states that "There is a lot of conversation still going on. I don't know anything else; I kind of am with everyone else in the waiting game." "I think I'm like all the fans going, 'So, what's happening?' But you know they will be the first ones to figure it out when we do. You never know, right?" So, at the moment, it is still unclear as to if the sequel will happen; but, let's keep our fingers crossed! "Did Brother Zachariah just steal our cat?" Lily Collins has Joined Instagram --Follow her Now! As you can tell, Lily Collins has not been on her official twitter account for over 2 years now. But finally, she has joined instagram! How do you know this is her official account? Well, her photos have a watermark of 2013 Lily Collins. According to Cassandra Clare's assistant, the final book to The Mortal Instruments has the saddest and happiest endings she read. My assistant just finished CoHF. She said "That was the saddest happy ending." 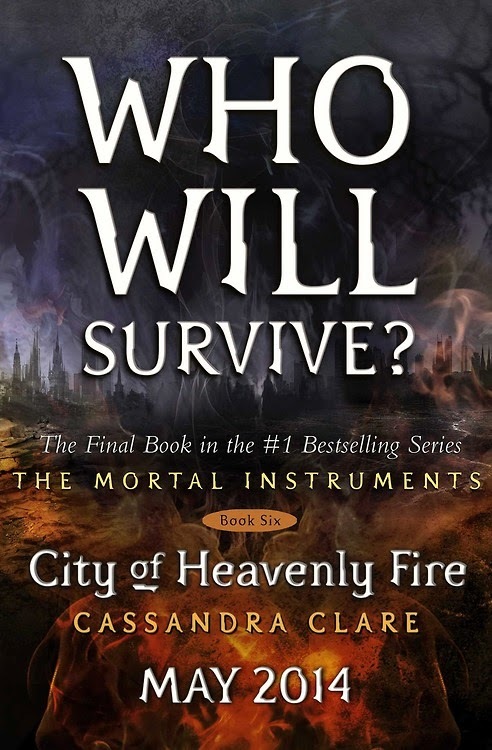 Could City of Heavenly Fire be the heartbreak of 2014? 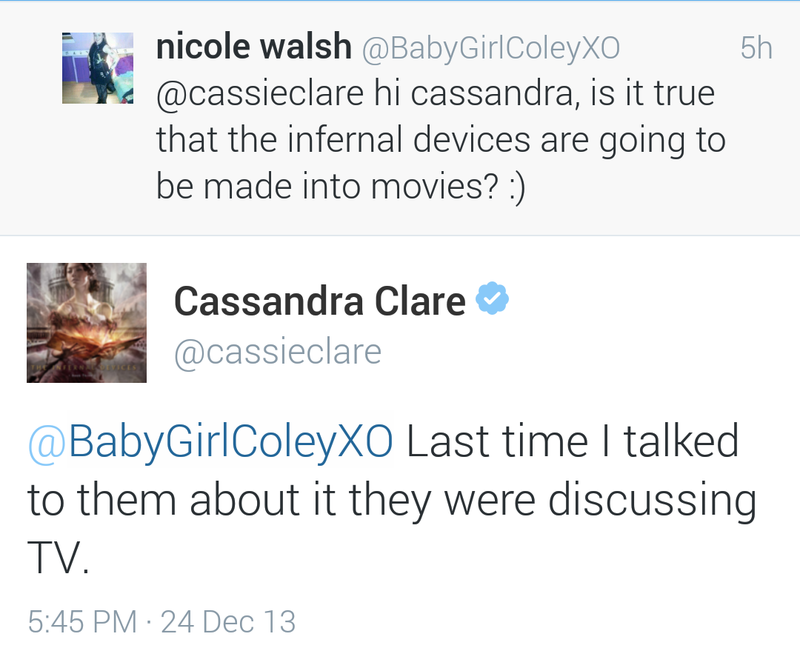 On the bright side, if you're lucky, Cassandra Clare might visit your area and you can gather happiness from that. “@mallorylynn99: " Are you having a City of Heavenly Fire tour next year?” Yes! 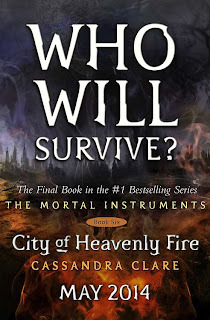 Which towns do you hope Cassandra Clare will visit? Sound off in the comments! Big congrats to The Mortal Instruments Facebook page for getting 1 million facebook fans! E! Online Asks "Which Fanchise has the Fiercest Heroine?" Check it out, E! Online is asking which heroine out of Hunger Games, Twilight, Harry Potter, Divergent and The Mortal Instruments has the strongest heroine. Strengths: The Shadowhunter can see monsters mortals can't—which comes in handy when they're trying to kill her and the people she loves. Clary also possesses the ability to create new runes because of the extra angel blood running through her veins. 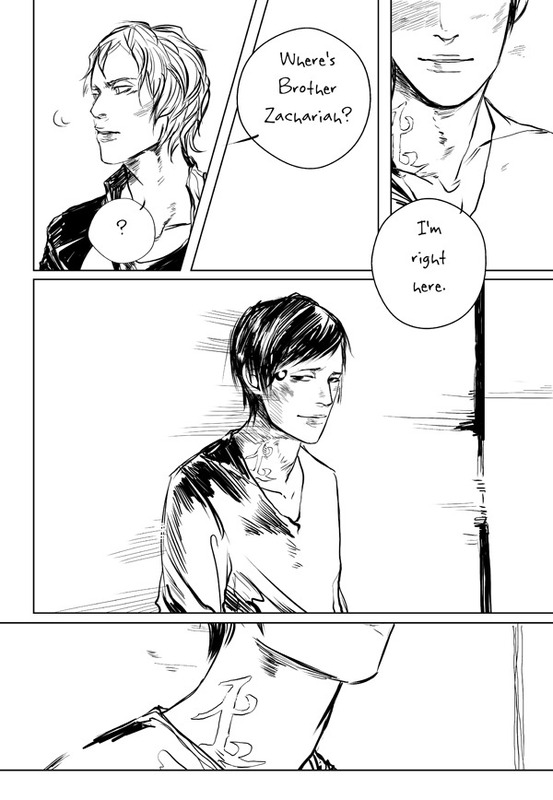 Weaknesses: Clary can be quite stubborn at times. Not long after her mother goes missing, she learns that her father, Jonathan Rhys Meyers' Valentine Morgenstern, has been experimenting on the Downworlders and demons, making him one of the most dangerous men she's ever encountered. For a time, she even believed that that her boyfriend, Jamie Campbell Bower's Jace Lightwood, might be her biological brother. Talk about a head-trip! Voice your opinion on E! Online's comment board! It's been a wild and crazy ride for the YA world in 2013. There have been amazing, wonderful new books--new friends to love, worlds to explore, and battles to fight. Here at YA Mag, we've prepared a fond farewell to YA 2013 with our Top 10 Biggest and Best YA Novels. These are the most talked about and/or well-received... and you should totally check them out! Check out all the other contenders and make sure you vote Clockwork Princess for Goodreads' Best YA Fiction & Fantasy 2013 too! Cassandra Clare's Clockwork Princess is nominated for Best Young Adult Fantasy & Science Fiction in Goodreads Choice Awards. Although there are a lot of amazing books running, just remember, Clockwork Princess is the last book in The Infernal Devices, it deserves to win! Hello! Cute boy got your attention? 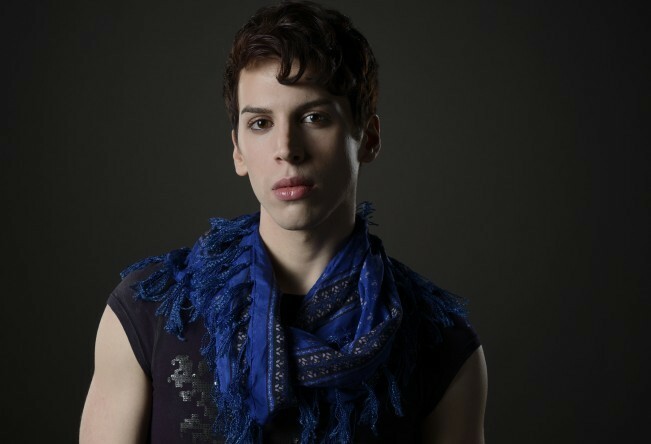 I am zipping by in the middle of editing to announce that Jordan Gavaris of Orphan Black will be reading the next of the Bane Chronicles. If you haven’t seen Orphan Black, Jordan’s character Felix is one of the most fantastic things about an already fantastic show with amazing performances, and we’re so happy to have Jordan reading what might be the funniest of the Bane Chronicles installments: What to Buy the Shadowhunter Who Has Everything. In which Magnus angsts, calls Ragnor, and seeks advice from a tentacled demon about his love life. The next installment for The Bane Chronicles will be out in about a week! 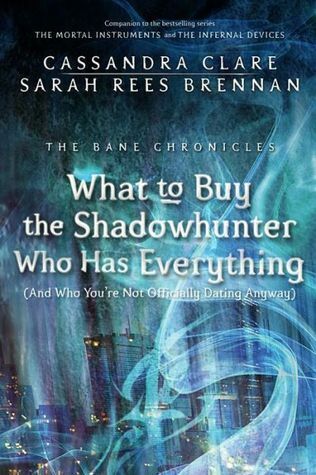 Check out this long snippet from What to Buy the Shadowhunter Who Has Everything: (And Who You're Not Officially Dating Anyways). “How have you been keeping? You know, since the last time you summoned me,” said Elyaas, the demon. “You don’t remember me?” said the tentacle demon. “I summon a lot of demons,” Magnus said weakly. There was a long pause. Magnus stared into the bottom of his coffee cup and desperately willed more coffee to appear. This was something a lot of mundanes did too, but Magnus had one up on those suckers. His mug did slowly fill again, until it was brimming with rich dark liquid. He sipped and looked at Elyaas, who was shifting uncomfortably from tentacle to tentacle. “It’s nothing personal,” said Magnus. “Lighting’s important, it’s true,” said Magnus. 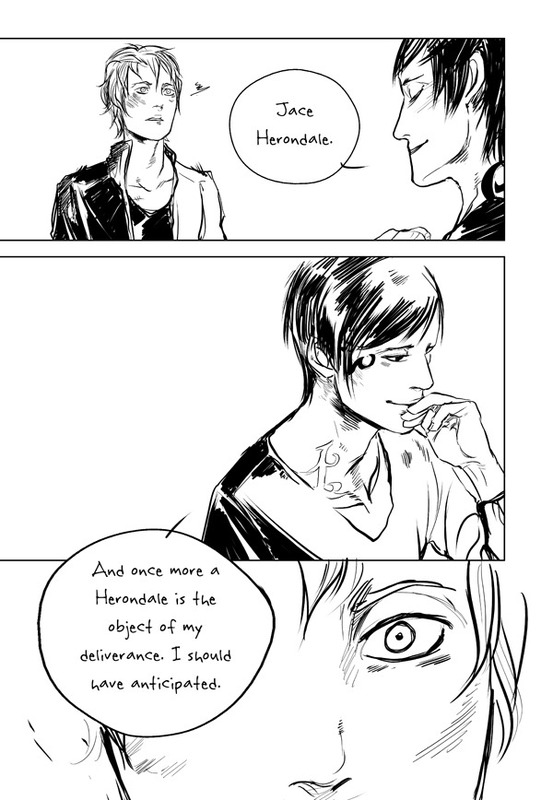 “So whatever happened with Bill Herondale and that curse a blue demon put on him?” The cecaelia demon’s interest seemed genuine. “You could have mentioned it a century or two ago,” Magnus observed frostily. 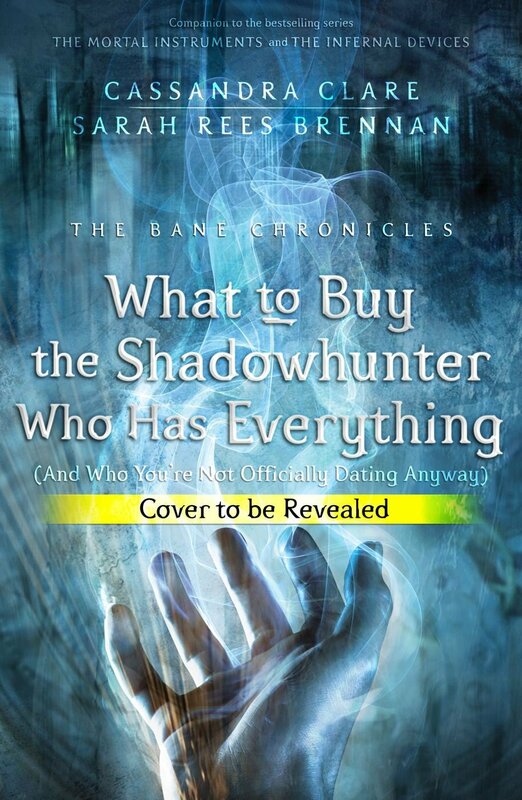 Cassandra Clare also revealed that they have some Bane Chronicles narrator news that she "thinks you will be pleased" about. While writing, Cassandra Clare tends to listen to certain tracks over and over again. These songs have small connections to the feeling of the story. Underneath each song is -what I think is- the verse that applies most to the plot of The Mortal Instruments: City of Heavenly Fire. Let’s pretend it’s not my heart. and it’s all the same to you. I would have loved you all my life. How the weight of their loss is like the weight of the sun. It was like their lives were over before they begun. And in the darkness I taught myself to hate. But where were you, oh where were you? And where the f*** did the sun go? Just a cage of rib bones and other various parts. And to stop the muscle that makes us confess. Breakable, breakable, breakable girls and boys. And drown us with the burdens of our sins. Tell you, you don’t wanna die. Maybe I’ll hold my breath and jump right in. 'Cause most of us are bitter over someone. Sons can be birds taken broken up to the mountain. It’s in my honey, it’s in my milk. Cover me in rags and bones, sympathy. 'Cause I don't wanna get over you. I don’t wanna get over you. And left there to sleep. And you, you must try to fly. So now, do you have a feel for what City of Heavenly Fire is going to feel like? Let us know in the comments!